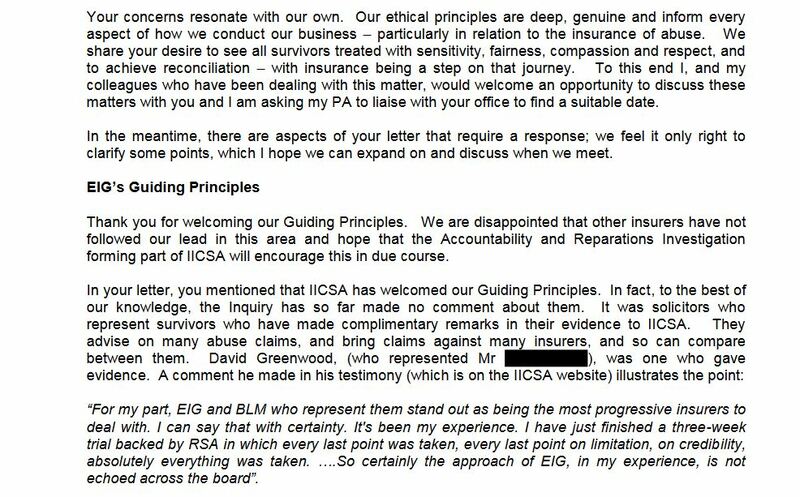 Ecclesiastical Insurance Group (EIG) is the Church of England’s insurance company. It was founded in 1887 to insure the Anglican church (…against acts of God?). Mark Hews, CEO, says: “We protect the irreplaceable – not just the bricks and mortar, objects or organisations but what they represent to the people that love and depend on them.” It must be quite a lucrative account – certainly one that they wouldn’t want to lose, for then, of course, the Ecclesiastical Insurance Group would simply become the Insurance Group: you can’t be very ecclesiastical if you don’t have a church. 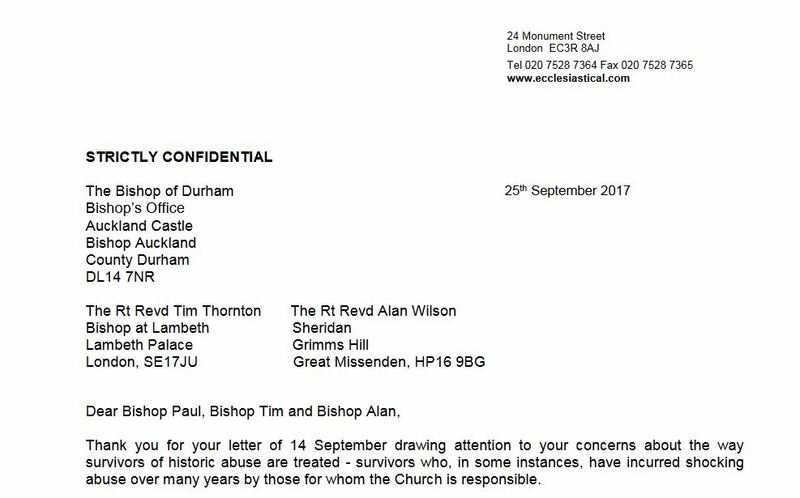 Three bishops (Durham, Lambeth and Buckingham) have excoriated EIG over the way they have handled issues of historic child abuse. 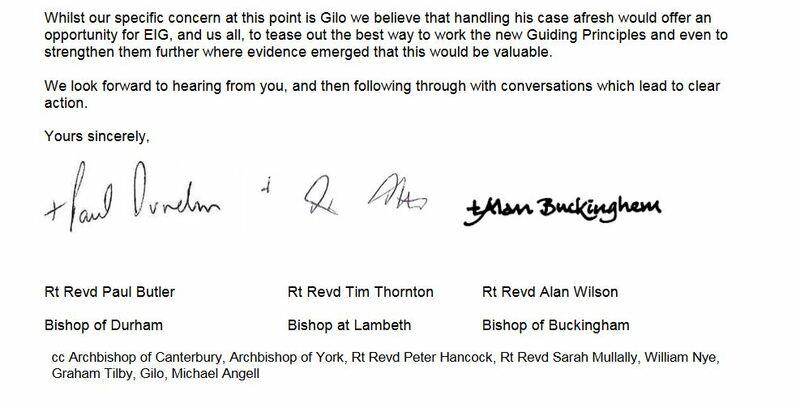 The Archbishop of Canterbury has done the personal apologising to Gilo, a survivor of child sexual abuse at the hands of a Church of England priest. 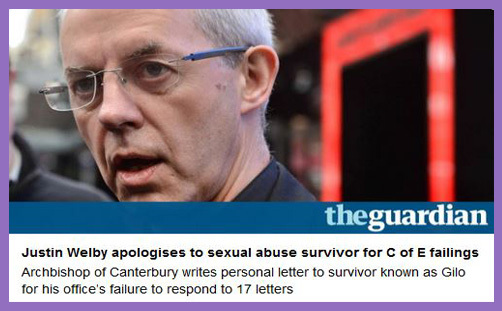 Gilo wrote 17 letters (seventeen) in the hope of seeing a little justice, or some acknowledgement of the suffering he endured. He received a response to just one – from a terse correspondence clerk – offering prayer. 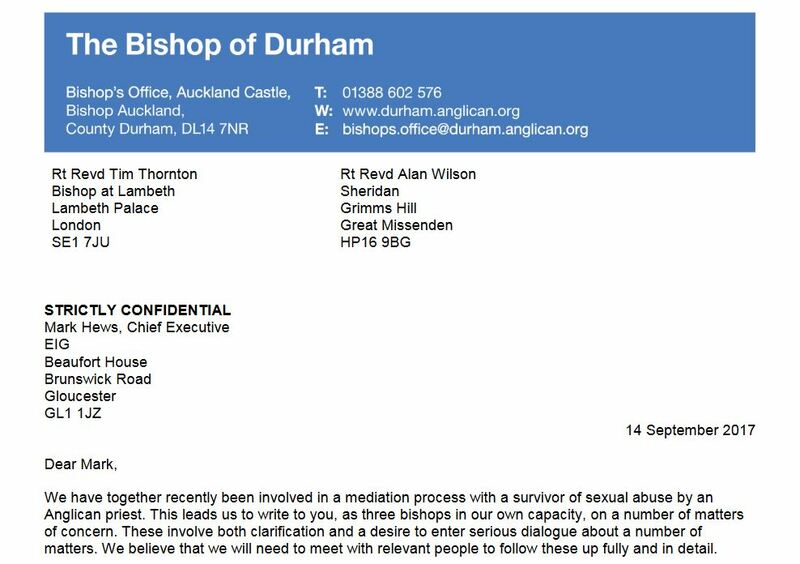 That’s not really adequate when you’ve been systematically groomed, plied with alcohol, striped naked and thrown face down on a bed by a minister of Christ, and then ignored by every priest and bishop you ever reported the matter to (except one, who kissed and cuddled rather a lot). 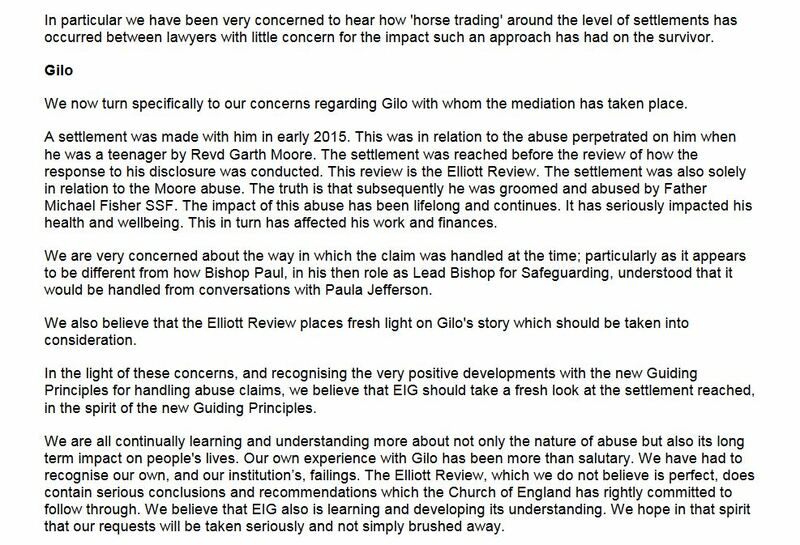 Gilo was eventually bunged £35,000 and told to go away. He carried on knocking, until the door was finally opened. 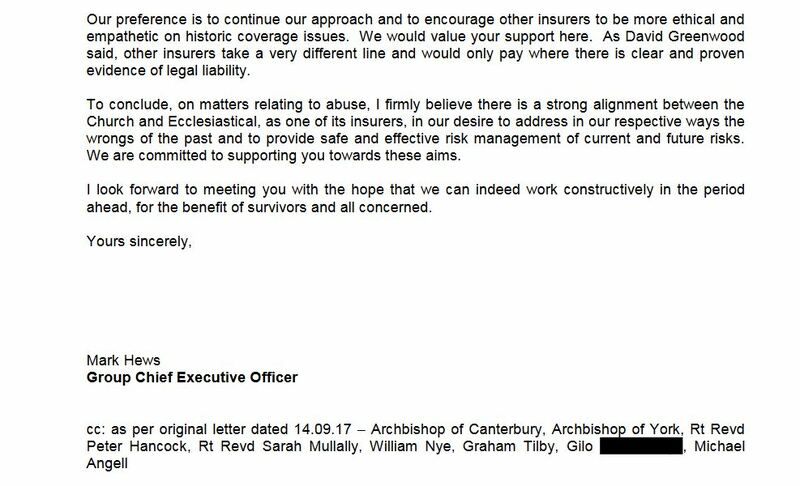 Bishops Butler, Thornton and Wilson are basically writing to fellow members of the clergy who are or have been officers of Ecclesiastical Insurance. The Very Rev’d Christine Wilson, Dean of Lincoln is presently on the Board of EIG. Former officers (with their former offices) include the Rt Rev’d Nick Baines (Bishop of Croydon), the Very Rev’d Nicholas Coulton (Sub-Dean of Christ Church, Oxford), the Very Rev’d Thomas Evans (Dean of St Paul’s Cathedral), the Ven. Reginald Harris (Archdeacon of Manchester), the Rt Rev’d Dr Nigel Peyton (Bishop of Brechin), the Very Rev’d John Simpson (Dean of Canterbury Cathedral), and the Rt Rev’d Donald Snelgrove (Bishop of Hull). 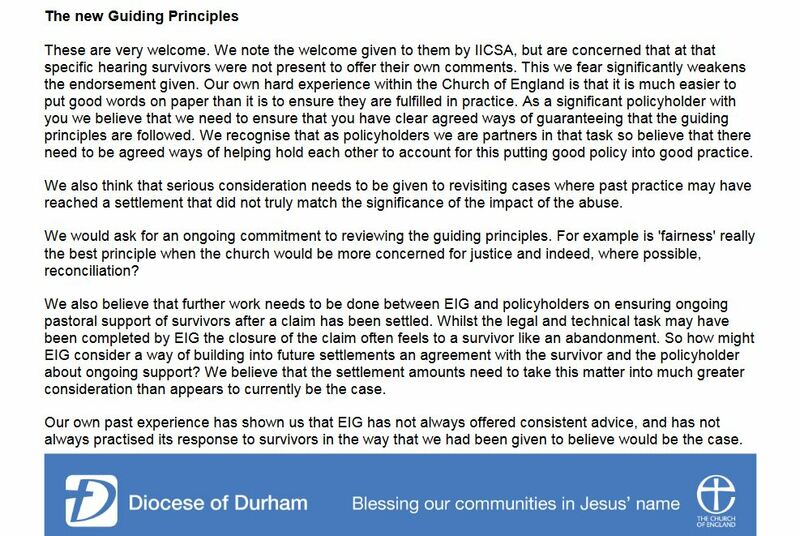 With Anglican clergy supervising and controlling EIG (which also insures a lot of church schools where there have been incidences of child abuse), there’s clearly a conflict of interest. 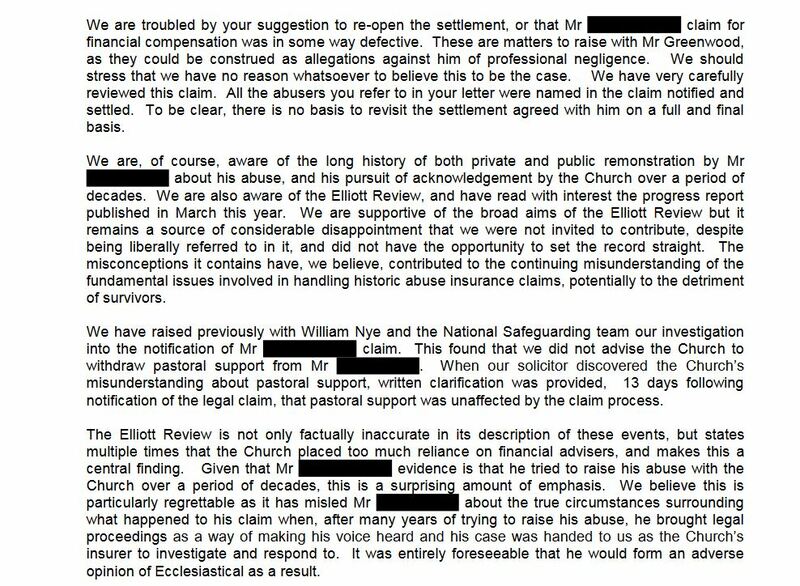 Indeed, ‘horse trading’ is inevitable if one group of clergy seeks to ensure minimal settlements to protect the interests of Ecclesiastical Insurance, and another group of clergy seeks generous settlements and maximum justice for the victims of abuse in order to protect the reputation of the Church of England. 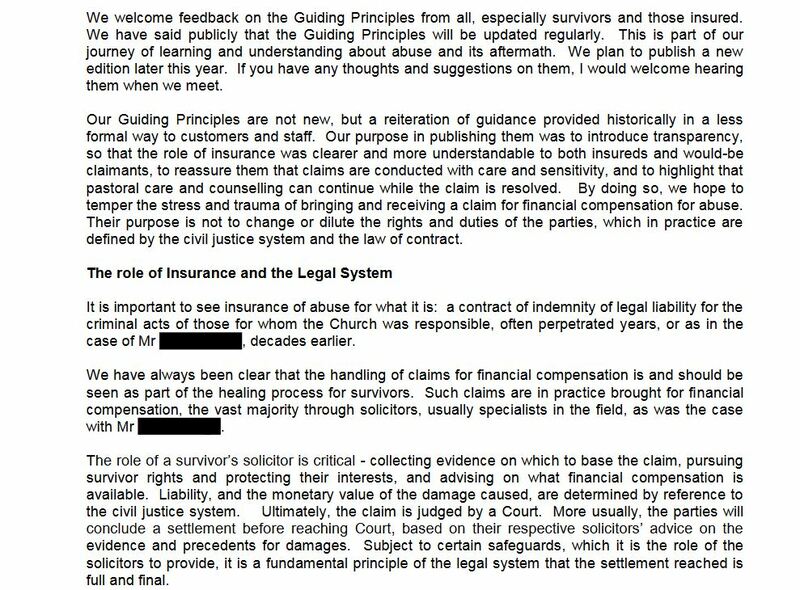 Aren’t low compensation settlements simply a logical economic consequence of seeking to maximise profit so you can swell the coffers of the Church Commissioners?